I had absolutely no sleep the night before my trip with Shaz to Sumatra, Indonesia. 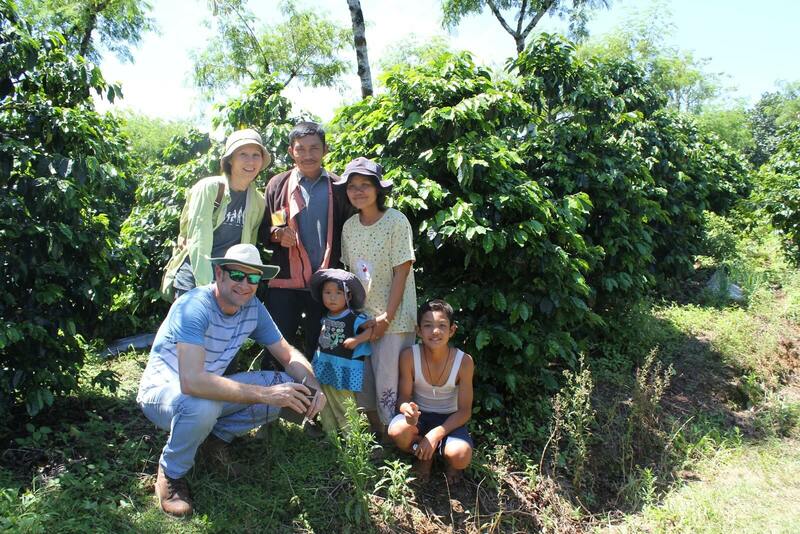 I was so excited to be visiting one of the coffee plantations we are purchasing beans from! Despite working as a roaster for many years, I’ve never had the opportunity to get to origin. Being a coffee roaster, I’m always interested in the raw green beans and in how I can roast them to get the best flavour out of them. Being able to see the processes of how these green beans are produced gives me more insight and more knowledge around each process – from the trees the cherries are grown on, to how they’re picked, processed, packed and transported until they land in my hands ready to roast. So off we flew to Medan, a big city in northern Sumatra, where we were greeted by horrendous traffic and flooded roads – it took over 2 hours to travel only a few kilometres! We checked into our hotel, then we were whisked out to dinner by Hendri, a friend of Shaz’s, to a small restaurant in an alleyway in downtown Medan. This was proper local cuisine – freshly cooked, spicy stuff! I loved it, and as it turns out, both Shaz and myself having a spicy tooth is a very good thing when it comes to eating in Indonesia! Every meal – no matter if it’s breakfast, lunch, or dinner – has some sort of chilli in it! The next morning, we were picked up by Andre from Coffee Practises / Opal Coffee for a 5 hour journey up into the mountains of the Sidikalang region. When we got up to the coffee growing region we saw the Sinabung Volcano that actually erupted just a few weeks before we arrived. You could still see steam rising out the top, an amazing sight, and hey… at least we know it’s fertile volcanic soil up there! Our first stop was Tigarungu Village where we met Mr Panjaitan, whose coffee farm is about 1 hectare in size. He’s one of about 400 farmers in this area with similar sized plantations. His farm is approved for Coffee Practices, which is a scheme created by Opal Coffee. Being Coffee Practices Certified means that each of these small lots are socially and environmentally responsible, while providing these farmers with education on methods of growing coffee trees that produce the best quality beans (or cherries). Speaking to Mr Panjaitan, he really liked the education he received from visiting a demo-plot that an agronomist provided to them from Coffee Practices. 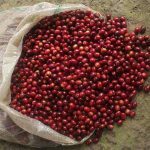 The agronomist assisted in showing the farmers what a coffee plantation should look like, and how to provide best quality cherries and crop yield. We visited a few other small lot farms that day, and it was interesting to hear what the farmers want out of Coffee Practices, which ranges from safety training, to personal protection equipment, to socialisation training, where the farmers can meet together and discuss any issues they have and figure out solutions. That night we stayed at the lovely Wahana Estate plantation which spans about 460 hectares. This was very exciting for me because I’ve roasted and drank Wahana coffee before and it was some of the best tasting coffee I’ve ever had! Within the estate they provide the workers with a clinic, schools and homes. There is also a Farmer Support Centre, where they have created a relationship with the small farms nearby in the area. They help farmers by giving information about farm management, and distributing shade trees, organic fertiliser and coffee seeds to farms for free. The next day we visited the wet mill on Wahana Estate. This is where the freshly picked coffee cherries are brought for processing. They are put into a water tank where the cherries are separated into floaters and sinkers. The ones that float are transferred to a separate tank, which will produce lower grade coffee beans. They then go through a pulpier, which removes the skin. These skins are saved so they can be used for compost – nothing goes to waste. After the cherries are pulped they are washed, then put into fermentation tanks overnight. I was in awe of the sheer size of this facility and the machinery and techniques used, but I soon realised I hadn’t seen anything yet! We went to the drying area where the beans go when they are taken from the fermentation tanks. This is a huge area under the shade of white canvas canopies where the beans are thinly laid out to dry. 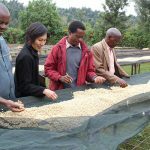 There were areas for washed and unwashed (natural process) beans to be laid out in even layers for drying. We then went into another area where there were many huge machine dryers. These are used for different drying methods or for when there is no room outside. The next room was my favourite part of the mill – the Wahana Naturals area. I cannot describe how good the aroma was in here. The dried coffee cherries still in their skins are stored for about 2 weeks, creating this amazing, sweet, fermenting aroma …yum! 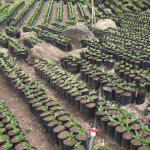 Back at the housing area where we stayed on the estate, they had a coffee tree nursery, where seedlings are planted. The roots systems of juvenile trees are checked before the next stage of early growth of the tree, to ensure only the highest quality trees grow on the estate. After Wahana, we visited a demo plot in the Sumbul Area. This is about 1 hectare in size and is run by Mr Simbolon with his wife and four children. He planted the shade trees from scratch, along with the coffee trees with the aid of an agronomist. This demo plot is where other farmers can visit and pick up some tips on how to grow their trees. Mr Simbolon gets an extra premium on the coffee cherries he produces because his is a demo plot. It was really cool seeing this particular farm, with the really healthy looking trees that looked like they are going to produce great quality cherries. There were traps under each tree for the borer beetle, which is a major pest for coffee trees. They lay their eggs in the flower of the tree, then when the flower becomes a fruit, the little grub inside affects the seed of the coffee cherry. So preventing these beetles from getting on the tree greatly helps the quality of the coffee. There were shade trees and herbs growing in between the rows of the trees to increase the fertility of the soil. 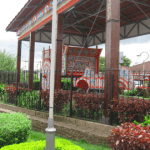 We then ventured back to Medan to visit Opal Coffee’s headquarters and dry mill. We did a tour of the dry mill facilities. This is where coffee beans are brought in from all over the country in parchment form for hulling. This was an amazing place and I was completely awestruck by the scale of production involved in getting the finished processed green beans packed into the hessian sacks. There were multiple, huge hulling machines that remove the parchment layer of the beans. They go through scales that then separate them into certain grades, screen sizing units, and equipment to remove any foreign objects. They are then put into sacks, sealed and stacked into massive piles (some were around 60ft high!). In another area there were about 100 ladies sitting on either side of 5 conveyer belts, picking out faulty beans. There was also a monsoon process area. This is a warehouse that is very hot and humid, and coffee beans will be stored in here for a number of years, so the beans become monsoon-processed, which is a style of coffee that’s very pungent. We then headed back to their office where we did cuppings and tasted coffees from the area’s we visited. Shaz and I got really excited because they were all really great coffees – including some that we’ve ordered to bring back home with us. I’ll never forget this fantastic trip. It was so rewarding to see firsthand the incredible effort that goes into producing the coffee we receive for roasting. The people here were so happy and friendly and Shaz and I were so grateful for the warm hospitality that was afforded to us. I was especially proud to show the locals how much chilli I could actually handle! I can’t wait to go back there. Our first delivery of coffee from these farms are arriving soon and I can’t wait to roast them and show everyone how great they are. Mike’s first encounter with coffee began at 16, watching the world cup in the wee hours of the morning, drinking coffee to stay awake. His defining coffee epiphany struck him a few years later after being blown away by an Indonesia Blu Batak. 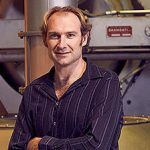 11 years later, Mike is now a qualified food chemist, Q Grader and award winning roaster. Like many in the coffee game, he has a passion to learn more about coffee farming and loves traveling to origin whenever he can. Mike loves to experiment with coffee, optimising roast profiles to get the very best out of our single origins and crafting small batch seasonal blends that shine in the cup. When Mike is not behind the roaster or cupping our latest deliveries, you’ll probably find him surfing in Sumatra, snowboarding or hanging out with Pepi, his beloved pet rabbit.